Durcan Services specify and install a range of high performance renders for either patch repair of damaged and blown render or complete re-renders. Where walls are particularly difficult to render GRC (Glassfibre Re-enforced Cement) is used to insure a perfect bond between the brick, stone or blockwork and the render. The GRC render comes in pre-mixed bags to guarantee consistency (poor consistency of mix is often the reason behind traditional render failure) and will extend the life of your rendered wall. The ultimate base coat render. ﻿Ideal for homeowners who are looking to transform the look of their property by covering over existing brick, block, stone, pebbledash and other uneven finishes. 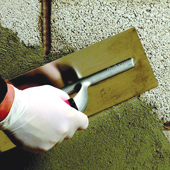 A GRC base coat is used to ensure a perfect bond between render and substrate. Smooth or textured decorative finishes can then be applied in a colour of your choice.